It’s not unusual for visitors to the Boeing Payloads Concept Center in Everett, Washington, to ask “So, what does the future look like?” It’s one of our favorite questions. As the group chartered to conceive and develop technologies and features for Boeing’s current and future aircraft interiors, we thrive on the data, trends and developments upon which the future is constantly building itself. Drawing a picture of that constantly shifting future challenges us to think about the unexpected results that can emerge from trends and technology developments. Understanding how economic, demographic, technological and social trends will interact to shape our daily routines and the things we take for granted gives us insights into what kind of interior features our customers will want and expect in future aircraft. To visualize this dynamic picture, we create what we call ‘future stories’. 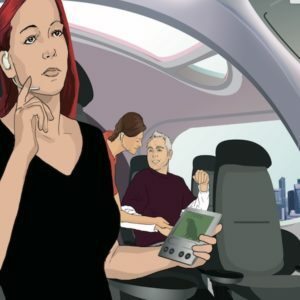 We build a story describing how a set of potential technologies and sociological developments will affect a typical traveler’s experience. We’ve recently been developing a story called ‘Flight 960- Year 2016’. That date gives us a handy stretch of 12 years to work with: just long enough for unexpected breakthroughs to surprise us; yet short enough that most of those breakthroughs are already in their infancy today. This allows us to have a little fun with some imaginative leaps, without getting wildly unrealistic. It also happens to be the 100th anniversary of Boeing’s founding. Who is the future air traveler? To find our main character, we first thought about the type of travel experience that we wanted to observe, then looked at what trend data and predictions tell us about the people who will have that travel experience, before building a persona to live that experience. Meet Jenny, our main character. She, like over 80% of US workers in 2016, works for a small business. Her company has partners and customers all over the world as even small businesses move toward distributed operations and the economy continues to globalize. For day-to-day business, Jenny takes advantage of tele-presence technologies that allow her to interact and collaborate almost as if she were there. This allows Jenny to live in her native Charleston, South Carolina, although her company is headquartered in Tempe, Arizona. However, sometimes almost being there is not enough, and Jenny must travel – joining the roughly 40% of airline passengers still flying on business. Even with ‘virtually there’ technologies, some aspects of business will always be best conducted in person. Like many people in the year 2016, Jenny has a small personal electronic device that rolls together a cellphone, personal digital assistant, Internet connection, computer and entertainment. Jenny’s is called a ‘Zed’, though other brands are available. One of the Zed’s most important functions is to keep Jenny in touch with her virtual personal assistant – a network-based assistant that she calls Max, after her first dog. Jenny doesn’t mind letting Max know the details of her daily routine and buying habits. Max has learned Jenny’s work schedule, favorite brands, travel preferences, vacation spots, entertainment and dining choices – even the environment settings that make her comfortable at her desk, at home, in the car, and on an aircraft. Max also knows her company’s travel policies, expense account forms, and security rules. Max knows it’s a business trip, so he’ll search for a single round-trip ticket, non-stop if possible, premium-economy class (unless business class is available for the same fare), and a flight time that works with Jenny’s meeting schedule. He looks for package deals with hotels and rentals, then presents Jenny with a list of possible itineraries, ranked in order of assumed preference. Jenny confirms the first itinerary on the list: Flight 960, nonstop from Charleston (CHS) to Singapore (SIN), (about 8,700 miles), revising only the time for the first evening’s dinner reservation. Jenny likes to travel light. She packs everything she needs in carry-on luggage, avoiding the waits at baggage check-in and claim. Max gives her a packing checklist, based on her last five two-night business trips. Good old Max, she marvels. She had almost forgotten her new book. Jenny arrives at the airport parking garage about 50 minutes before her flight – a bit early, as traffic was light. She walks straight to a check-in kiosk and tells Max to upload the ticketing information. In a few seconds, the kiosk asks for an iris scan, then passes the validation information to Max. A little later, Max informs Jenny through the wireless earpiece she almost always wears that her flight is on time and will be leaving from Gate N3. Max will let her know when the aircraft is ready to board. Jenny is barely aware of passing the security checkpoint. Screening for items and materials occurs unobtrusively at several points throughout the concourse. On the way to the gate, Jenny strolls through the shopping area. As Jenny browses, the Zed vibrates to announce that her section will begin boarding about seven minutes late – time to browse for a few more minutes before heading for the gate. The line at the gate has gone down considerably when Jenny arrives. “Perfect timing, Max,” she thinks, glad to have avoided a wait. Jenny places her rolling bag in the convenience cart at the head of the boarding queue. It’s a pleasant change not to have to drag roller bags down the aisle and wrestle them into the overhead stowage. At the destination, the convenience carts will be unloaded first and passengers will retrieve their bags as they leave the gate area. After verifying her iris scan at the jetway door, a colorful display welcomes Jenny to flight 960 and invites her to board. A flight attendant welcomes Jenny aboard with a smile. Jenny stands for a second in the broad entryway, dazzled by the last evening sunlight streaming in from the skylight above the aircraft’s door. As she steps into the main cabin, the far aisle marker illuminates to indicate the direction to her seat. Turning down the aisle, she sees her name projected on the aisle seat in the second row. Dropping her attaché on the middle seat, she takes her place on the aisle. With just a touch of anticipation, Jenny waits for the last few passengers to file in. No name appears on the empty seat beside her, so none of the entering passengers are assigned to that seat. When the “Door closed” announcement sounds, she exchanges smiles with the window-seat passenger and they divide up in the unclaimed area. “Great! This is one of the latest interiors,” Jenny thinks, noticing the pocket for personal electronics in the seatback. She tucks her Zed into the pocket for a recharge, then lowers her seat and armrests a bit to get comfortable. Jenny points the seatback air outlet to freshen the air around her face and lowers the seat temperature setting a little as the aircraft is beginning to taxi out to the runway. As the jetliner climbs to cruising altitude, the ceiling glows with the subtle light of evening. Wispy, sunset-colored clouds glide the length of the cabin beneath the cobalt sky – one of Jenny’s favorite effects. Jenny watches the lights of Charleston pass below. The aircraft’s large windows give a good view, even from the aisle seat. Checking back in with the rest of the world, Jenny asks Max to show all her personal messages on the large seat-back screen. She chooses to view them as text – except her mother’s inevitable good wishes for a pleasant flight, which must be heard in ‘Mom’s’ own voice. Jenny types a short note to her sister on the tray table keyboard, knowing her sister will listen to the message on her phone, as usual. Jenny spends the next half hour on her business messages. Feeling she has a good head start on tomorrow’s business, Jenny readies the tray table for the vegetarian meal Max ordered when he scheduled the flight and dons a stereo earpiece for her other ear. She selects some dinner music from her Zed. These new noise canceling earpieces are as good for listening to music on aircraft as they are for phone calls on city sidewalks. But they’ll really prove their worth at bed time! The stars are shining brightly on the ceiling as Jenny finishes dinner. She leans back and selects the current episode of her favorite TV show on her Zed. Having just managed to stay awake through the show, Jenny then selects a relaxing music playlist, lays her head back, and closes her eyes. When Jenny opens her eyes, Max has reclined her seat to help her sleep. The orange and pink hues of dawn wash across the ceiling. Projected below the simulated morning sky, a holographic globe displays the aircraft’s current location –about two and a half hours out of Singapore. “Wow, a full eight hours’ sleep. I seldom get that at home,” she thinks. The tele-presence screen appears on her seatback display. The list of suppliers occupies center screen. A window containing Jenny’s video image joins those of the other participants, arranged around the screen’s perimeter. Hugh, Jenny’s closest friend in the Tempe office, quickly sets up a side discussion for the two of them. “Jenny, glad you could join us, let me get you up to speed,” he says, pulling up a file from his online folder. “It has to do with this group right here,” he adds, circling three of the suppliers on the list. “I already accounted for that in my latest numbers,” Jenny replies and asks Max to send Hugh her latest supplier file while they rejoin the main meeting. The holographic image of the aircraft is nudging toward Sumatra by the time the meeting concludes. Jenny hurriedly pulls out her book and turns the light to the reading setting, determined to squeeze in a chapter or two. The aircraft has touched down and is rolling towards the gate when Max alerts Jenny to the display on the seatback. A map of the airport shows Jenny where to pick up her rental car. Max downloads the information, just in case Jenny needs a reminder. Jenny pauses briefly to pick up her rolling luggage from the convenience cart as she leaves the gate area. “Which way to the rental car?” she asks Max. “Just past Customs and Immigration to your left,” Max advises. Jenny’s experience on flight 960 is just a narrow slice of the future. We saw convenient baggage carts that enabled Jenny to carry less into the passenger cabin. We saw a new electronic device that changes how Jenny communicates, chooses entertainment, makes purchases, and does business. We saw the aircraft becoming a node in the information network, keeping Jenny connected with loved ones, colleagues, and the unflagging pace of life on Earth. And we saw a more individually comfortable aircraft that enabled her to relax for a few hours. 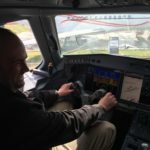 The whole picture of passenger experience in the year 2016 would take a panoramic view of Jenny’s fellow travelers – the retired couple on vacation, the couple with young kids visiting grandparents, even the flight attendants. Such a view would enable us to zoom in on details – from life-saving medical technologies to new concepts in lighting, architecture, seating, lavatories, meal service, information display and much more. So if you ask us what we think the future will look like, we might start off by introducing you to Jenny.